View of the arches in the interior of the Nasir-ol-Molk Mosque, also known as the Pink Mosque, which is a traditional mosque located in Shiraz district of Gowad-e-Arabān, Iran. The mosque was built from 1876 to 1888, by the order of Mirzā Hasan Ali (Nasir ol Molk), a Qajar ruler. English : View of the arches in the interior of the Nasir-ol-Molk Mosque, also known as the Pink Mosque, which is a traditional mosque located in Shiraz district of Gowad-e-Arabān, Iran. The mosque was built from 1876 to 1888, by the order of Mirzā Hasan Ali (Nasir ol Molk), a Qajar ruler. English : Surviving fragment of The Story of the Kelly Gang, an Australian silent film believed to be the world's first full-length narrative feature film. English : Newman Laugh-O-Gram (1921), featuring Walt Disney himself, is his first animated cartoon. English : Obedience (1965) is an American documentary film on the Milgram Experiment. English : The Evoltion of the Skirt [sic] (1916) is an Australian silent animated film by Harry Julius. These well-preserved basalt columns are known as "Symphony of the Stones" and are located in the Garni Gorge, near Yerevan, capital city of Armenia. The columns are visible because they were carved out by the Goght River. English : These well-preserved basalt columns are known as "Symphony of the Stones" and are located in the Garni Gorge, near Yerevan, capital city of Armenia. The columns are visible because they were carved out by the Goght River. English : Symptoms in Schizophrenia is a 1938 silent documentary film on schizophrenia. The Bronze Horseman in Saint Petersburg, Russia. English : The Bronze Horseman in Saint Petersburg, Russia. English : Alexander's Ragtime Band, a song by Irving Berlin, recorded by Billy Murray in 1911. The crenellated parapet on a bastion of Kyrenia Castle, Cyprus. 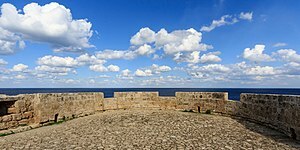 English : The crenellated parapet on a bastion of Kyrenia Castle, Cyprus. English : A short animation by Nina Paley arguing that all copyrighted work is derivative. English : Eaux d'Artifice is a 1953 short experimental film by Kenneth Anger. Eurasian lynx (Lynx lynx) in the Zoo of Madrid, Spain. English : Eurasian lynx (Lynx lynx) in the Zoo of Madrid, Spain. English : Viaggio in Congo (1912) is an Italian silent documentary film by Guido Piacenza on the Mangbetu people. Overview of the courtyard of the Agha Bozorg mosque, a historical mosque in Kashan, Iran. The mosque, located in the center of the city, was built in the late 18th century by master-mimar Ustad Haj Sa'ban-ali. The mosque has of two large iwans, one in front of the mihrab and the other by the entrance and the courtyard in the middle. English : Overview of the courtyard of the Agha Bozorg mosque, a historical mosque in Kashan, Iran. The mosque, located in the center of the city, was built in the late 18th century by master-mimar Ustad Haj Sa'ban-ali. The mosque has of two large iwans, one in front of the mihrab and the other by the entrance and the courtyard in the middle. English : Don't Leave It All to The Experts is a 1967 film from the United States Public Health Service on citizens role in environmental decision making. The Soyuz TMA-13 spacecraft, carrying Expedition 18 Commander Michael Fincke, Flight Engineer Yury V. Lonchakov and American spaceflight participant Richard Garriott, launched Sunday, October 12, 2008, from the Baikonur Cosmodrome in Kazakhstan. The three crew members docked with the International Space Station on October 14. Garriott returned to Earth on October 24 with two members of the Expedition 17 crew, while Fincke and Lonchakov remained on the station for six months. English : The Soyuz TMA-13 spacecraft, carrying Expedition 18 Commander Michael Fincke, Flight Engineer Yury V. Lonchakov and American spaceflight participant Richard Garriott, launched Sunday, October 12, 2008, from the Baikonur Cosmodrome in Kazakhstan. The three crew members docked with the International Space Station on October 14. Garriott returned to Earth on October 24 with two members of the Expedition 17 crew, while Fincke and Lonchakov remained on the station for six months. English : Die geheimnisvolle Streichholzdose is a 1910 German silent short stop motion film by Guido Seeber. The Rho Ophiuchi cloud complex is a star-forming region located only 400 light years from Earth. It is surrounded by a red emission nebula and numerous light and dark brown dust lanes. Nearby is the yellow star Antares while the globular cluster, M4, is visible between Antares and the red emission nebula. Toward the bottom can be found IC 4592, the Blue Horsehead nebula. English : The Rho Ophiuchi cloud complex is a star-forming region located only 400 light years from Earth. It is surrounded by a red emission nebula and numerous light and dark brown dust lanes. Nearby is the yellow star Antares while the globular cluster, M4, is visible between Antares and the red emission nebula. Toward the bottom can be found IC 4592, the Blue Horsehead nebula. English : Independenţa României is a 1912 Romanian silent film by Aristide Demetriade on the Romanian War of Independence. Indosylvirana urbis, Urban Golden-backed Frog, is a species of frog known only in the southern Western Ghats in Kerala. Here it is resting comfortably in the pink colored boat-shaped bract of the Curcuma angustifolia (East Indian Arrowroot) flower. English : Indosylvirana urbis, Urban Golden-backed Frog, is a species of frog known only in the southern Western Ghats in Kerala. Here it is resting comfortably in the pink colored boat-shaped bract of the Curcuma angustifolia (East Indian Arrowroot) flower. English : Combat Fatigue Irritability is a 1945 short film by and with Gene Kelly on combat stress disorder. Panorama of the Tobolsk Kremlin from the Cape Chukman. Tobolsk, Russia. English : Panorama of the Tobolsk Kremlin from the Cape Chukman. Tobolsk, Russia. English : Defence of Sevastopol (1911) is the first Russian feature film. A MK-46 exercise torpedo is launched from the deck of Arleigh Burke-class guided-missile destroyer USS Mustin (DDG 89) during a torpedo launch exercise in Philippine Sea. English : A MK-46 exercise torpedo is launched from the deck of Arleigh Burke-class guided-missile destroyer USS Mustin (DDG 89) during a torpedo launch exercise in Philippine Sea. English : Blondes Prefer Gentlemen is a 1965 educational film on dating etiquette. View of the Castle of Zafra, Campillo de Dueñas, Guadalajara, Spain. The castle was built in the late 12th or early 13th centuries on a sandstone outcrop and stands on the site of a former Visigothic and Moorish fortification that fell into Christian hands in 1129. It had considerable strategic importance as a virtually impregnable defensive work on the border between Christian and Muslim-ruled territory. The castle was never conquered and was successfully defended against the King of Castile in the 13th century. The successful completion of the Reconquista at the end of the 15th century ended its military significance. English : View of the Castle of Zafra, Campillo de Dueñas, Guadalajara, Spain. The castle was built in the late 12th or early 13th centuries on a sandstone outcrop and stands on the site of a former Visigothic and Moorish fortification that fell into Christian hands in 1129. It had considerable strategic importance as a virtually impregnable defensive work on the border between Christian and Muslim-ruled territory. The castle was never conquered and was successfully defended against the King of Castile in the 13th century. The successful completion of the Reconquista at the end of the 15th century ended its military significance. English : Le paravent de Cagliostro is a 1912 stencil colored trick film by Segundo de Chomón. A Cirrus fibratus cloud front on evening sky as seen over Austnesfjorden from Sildpollneset in Austvågøya, Lofoten, Norway in April 2015. English : A Cirrus fibratus cloud front on evening sky as seen over Austnesfjorden from Sildpollneset in Austvågøya, Lofoten, Norway in April 2015. English : Bride of the Monster is a 1955 film by Ed Wood starring Bela Lugosi. Salvatore Puccio from Sky team – 1st stage Tour of Slovenia 2015. Time trial on the streets of Ljubljana, Slovenia. English : Salvatore Puccio from Sky team – 1st stage Tour of Slovenia 2015. Time trial on the streets of Ljubljana, Slovenia. English : A Bronx Morning is a 1931 experimental film by Jay Leyda. English : A tape head cleaner cassette made of clear hard plastic. The plastic is birefringent and demonstrates internal stress as coloured patterns (photoelasticity) when photographed using cross polarisation. The polarising light source (an LCD monitor) has been rotated such that the polarising filter on the lens is oppositely oriented and so cuts out all the direct light, leaving a black background. A port security boat assigned to Maritime Expeditionary Squadron (MSRON) 1 patrols the waters near Kuwait Naval Base. MSRON-1 is deployed supporting maritime security operations and port security operations in the U.S. 5th Fleet area of responsibility. English : A port security boat assigned to Maritime Expeditionary Squadron (MSRON) 1 patrols the waters near Kuwait Naval Base. MSRON-1 is deployed supporting maritime security operations and port security operations in the U.S. 5th Fleet area of responsibility. Panorama of the Imperial Academy of Arts building in Saint Petersburg, Russia. English : Panorama of the Imperial Academy of Arts building in Saint Petersburg, Russia. English : Today is Earth Day, and this video shows the Earth filmed from the International Space Station by NASA in ultra high definition. Exemplar of brown pelican (Pelecanus occidentalis), Punta Pitt, San Cristóbal Island, Galápagos Islands, Ecuador. English : Exemplar of brown pelican (Pelecanus occidentalis), Punta Pitt, San Cristóbal Island, Galápagos Islands, Ecuador. English : Two brown pelicans (Pelecanus occidentalis) diving into the sea to catch fish in Jamaica. The Spring path at the island of Mainau during the tulip blooming. English : The Spring path at the island of Mainau during the tulip blooming. English : The large Jet d'Eau fountain in the centre of Geneva, Switzerland. Anzac Parade from the Australian War Memorial in Canberra, Australian Capital Territory. In the distance is Old Parliament House, and behind that is the new Parliament House. Today is ANZAC Day, the day of recognition of Australians and New Zealanders who served their country. English : Anzac Parade from the Australian War Memorial in Canberra, Australian Capital Territory. In the distance is Old Parliament House, and behind that is the new Parliament House. Today is ANZAC Day, the day of recognition of Australians and New Zealanders who served their country. English : Le avventure straordinarissime di Saturnino Farandola is an Italian 1913 silent film by Marcel Perez based on Albert Robida's eponymous novel, The Extraordinary Voyages of Saturnin Farandoul. Stephen Hawking (center) enjoys zero gravity during a flight aboard a modified Boeing 727 aircraft owned by Zero Gravity Corporation. Hawking is being rotated in air by (right) Peter Diamandis and (left) Byron Lichtenberg. English : Stephen Hawking (center) enjoys zero gravity during a flight aboard a modified Boeing 727 aircraft owned by Zero Gravity Corporation. Hawking is being rotated in air by (right) Peter Diamandis and (left) Byron Lichtenberg. English : Personnel training and fire training alarm in Karelian Research Centre of RAS, 2018. Painting of the Last Supper and mosaic of the Death of the Virgin, Cocoș Monastery, Romania. The monastery, located in a forest clearing 6 km of Niculițel, was built between 1883 and 1913 and is dedicated to the Dormition of the Theotokos. English : Painting of the Last Supper and mosaic of the Death of the Virgin, Cocoș Monastery, Romania. The monastery, located in a forest clearing 6 km of Niculițel, was built between 1883 and 1913 and is dedicated to the Dormition of the Theotokos. English : La Chenille de la carotte is a 1911 French stencil-colored short film on the Papilio machaon caterpillar. An olive baboon (Papio anubis) with juvenile, Queen Elizabeth National Park, Uganda. After the visit of Queen Elizabeth II and Prince Philip, Duke of Edinburgh from 28-30 April 1954, Kazinga National Park was renamed in her honour. English : An olive baboon (Papio anubis) with juvenile, Queen Elizabeth National Park, Uganda. After the visit of Queen Elizabeth II and Prince Philip, Duke of Edinburgh from 28-30 April 1954, Kazinga National Park was renamed in her honour. English : Theatrical trailer for Billy Wilder's 1957 film Love in the Afternoon with Gary Cooper, Audrey Hepburn and Maurice Chevalier. English : Airmen from the 14th Airlift Squadron at Charleston Air Force Base deliver relief vehicles and supplies to San Juan, Puerto Rico, in the aftermath of Hurricane Irma. Zhavoronki are traditional Eastern Slavic cookies. Photographed in Shebekinsky District of Belgorod Oblast, Russia. English : Zhavoronki are traditional Eastern Slavic cookies. Photographed in Shebekinsky District of Belgorod Oblast, Russia. English : Common kingfishers (Alcedo atthis) in Slovakia.